There are two types of tray liners that dominate the market; one goes in fast food trays and the other lines kitty-litter boxes. That crunchy nugget alone should tell you all you need to know, but today we’re going to dig all the way to the bottom for a special treat. 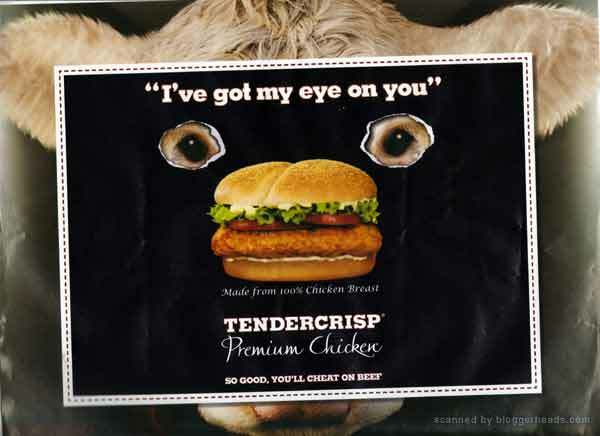 Yes, the cow is angry because you are eating chicken. It is jealous. The cow wants you to eat it instead. And unlike the pig that wants to be eaten, the cow’s not even bothering to be polite about it. Again, I should warn you that your mind may betray you at this point as it stubbornly clings to reason… but the cow’s wish that you eat it – and its willingness to stalk you to the bottom of every food tray – is part of a weird, sexual relationship that you’re a willing partner to (according to Burger King). Now, don’t get me wrong here; I do eat cow now and again and I do enjoy it. I’ve even dabbled in a little animal husbandry to the extent of having my entire forearm inside a cow’s bottom at one stage, but at no stage did I utter the words “Oh, you love it!” or go on to imagine a cow gaining pleasure from any beef-related mastication at the dinner table. Putting aside what any given cow may or may not be capable of feeling about any assertion that they gain sexual pleasure and form deep emotional attachments as a result of being minced, grilled and munched; eating the high amounts of sugar, fat and salt in a typical burger triggers a fleeting pleasure response in your brain, and Burger King are clearly trying to associate that with sexual pleasure in order to sell more chicken or beef burgers (a win/win situation from their POV). I don’t plan on having a cow about it; quite the opposite, actually. I don’t spend money on companies that knowingly exploit the witless or insult my intelligence, and any money I spend on fast food in the next 3 months will not be spent on Burger King.